Aisha Buhari has alleged that people that are too powerful are preventing President Buhari’s government from moving forward. The First Lady, who described them as retrogressive elements, said that they have become clogs in the wheels of development of the current administration. She said this while speaking at a conference organized by Project 4+4 in Abuja, according to reports. Mrs. Buhari also told those present that the government has made a lot of progress, but would have achieved more if not for the two men. The First Lady did not mention the names of the men she was talking about. 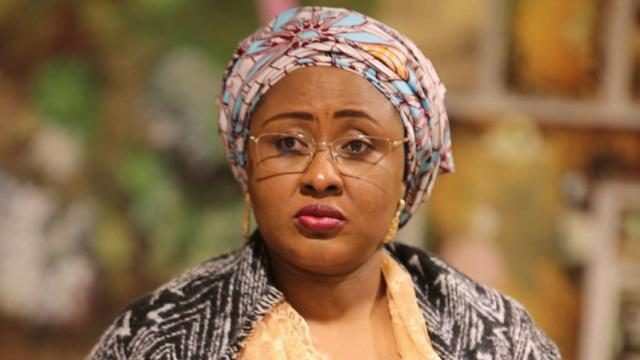 In October 2016, Aisha Buhari during an interview with BBC, openly criticised the President saying that she might not support his 2019 re-election bid. She also claimed that some people have hijacked Buhari’s government. “”Some people are sitting down in their homes folding their arms only for them to be called to come and head an agency or a ministerial position. “…If things continue like this up to 2019, I will not go out and campaign again and ask any woman to vote like I did before. I will never do it again,” she said. Mrs. Buhari also alleged that a ‘powerful caucus’ is behind the presidential appointments.